We all have people in our lives who seem to have everything - people that no gift seems to be a good fit for - for several years, we struggled with what to do for those loved ones for Christmas. Then a few years ago we found the answer... the World Vision Christmas Gift Catalog. Before we were married, Brad sponsored a child through World Vision for me - a little girl in Guatemala who we continue to support today. It's been a gift that has kept on giving over the years! The more we've learned about World Vision, the more we love the organization. 86% of monies donated to WV go to help those in need - few charities are that efficient. Goats have been a favorite gift over the years - this year chickens are of appeal, as Walker loves eggs and eats several for breakfast each morning. 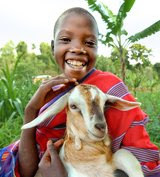 The thought of providing an impoverished family with livestock that can change their lives - it's a gift for both the recipient and the giver! There are 7 gifts priced under $20 - so don't feel like you have to spend a ton to help someone in need. You also have the option to purchase a "share" of a larger item if that's of greater appeal to you. He's not quite there yet, but we can't wait until Walker is old enough to pick out gifts with us. What a great way to help your children learn more about giving and helping those in need. 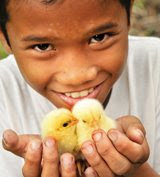 So if you have someone on your Christmas list who doesn't "need" anything - give the World Vision Gift Catalog a look!